Artist’s concept of the Cold Atom Laboratory (CAL). An Antares rocket launched from Virginia before sunrise this morning and is on its way to the International Space Station. Its 7,400 pounds of cargo include an experiment that will chill atoms to just about absolute zero—colder than the vacuum of space itself. 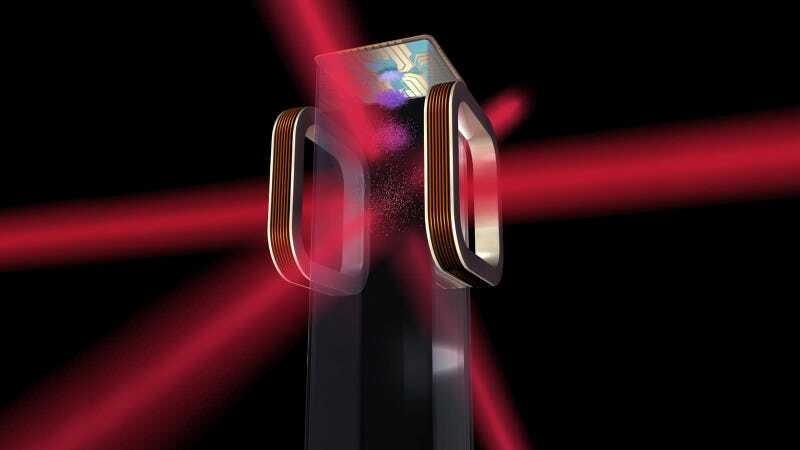 The Cold Atom Laboratory (CAL) is set to create Bose-Einstein condensates on board the ISS. But what’s a Bose-Einstein condensate? And why make it in space? “Essentially, it’s going to allow us to do different kinds of things than we’d be able to do on Earth,” Gretchen Campbell, co-director of the University of Maryland’s Joint Quantum Institute, told Gizmodo. Bose-Einstein condensates are collections of certain atoms (like rubidium, for example) held motionless by lasers, which cools them to temperatures just above absolute zero. These systems magnify the mind-boggling effects of quantum mechanics to nearly macroscopic scales, making them easier to study. Scientists have used Bose-Einstein condensates to create entirely new states of matter, quantum entangle thousands of atoms, and even model the Big Bang. But as is the case with most nearly macroscopic collections of atoms, Bose-Einstein condensates feel the effects of gravity. That means that they fall down when you turn off the lasers that freeze them in place on Earth. On board the ISS where there’s only microgravity, scientists can perform these experiments and observe the Bose-Einstein condensates for longer. Since these systems magnify the effects of quantum mechanics to larger scales, they could be used to gain insights about unrelated systems. Perhaps the system could provide insight into the nature of dark energy, the mysterious force accelerating the expansion of the universe that seems to account for two-thirds of the universe’s energy, according to a NASA fact sheet. The Antares rocket should arrive at the ISS on Thursday, reports Space.com. On top of resupplying the space station, it also carries a plant-growth experiment and some cubesats, as well as other research equipment.